I got my first PC board back from Seeed Studios on Saturday; they arrived mid-week, but since they shipped from China, I had to go to the Post Office to retrieve them and sign the customs form. The box had a variety of parts including a big bag of tiny switches, and it had the five PC boards. I put my own board together that afternoon and tested it, but the real fun was earlier tonight when we got three more of the boards populated and flashing lights. Eric Moore got his waves test pattern running in a spiral configuration, and it looks really nice, especially bounced off a dark ceiling or wall. There's more pictures at Flickr, and I should soon have the website at http://combee.net/rgbshield populated with part lists and assembly instructions. I've got a few tweaks to make for a version 1.2 of the shield based on our experiences putting these together, but nothing that should be too difficult to setup. Any more pics or videos of the boards in action? We want more board pron! I'm working on a video. Flashing LEDs are hard to capture on a video camera, as the light from them doesn't capture well with the CCD sensors. I did get some footage on Sunday night that might work, but I need to edit it a little before uploading it. Is it the total light from the LEDs or the speed at which the LEDs flicker? If it's the latter, can you just slow down your programs then speed up the video keystone-kops style? Maybe I just have fast-frame animation on my mind. I was wondering last night while fast forwarding through DVR commercials why someone hasn't put an area of their commercials at the usual fast-forward speeds to have mini-commercials for folks zipping through them. Or maybe it's been tried before and I've just missed it. It's a bit of both. The LEDs are driven by a PWM chip which is rapidly turning them on and off to get the desired brightness. I can't really slow that down. In some of the footage, you get a shadow image of the LEDs about half a frame below. I'll probably just go ahead and put that stuff up, though. Got one, built board, put on all jumpers, pluged into Mega. Fired up, all blue led's came on due to something already running on Mega. Downloaded .h file for 1.4. Made change for 3 driver chips as noted. Downladed each of 4 sample .pde files you provided, they load and run, but nothing happens. Have no external jumper wires for Mega to the RGB shield, as I thought they were all provided now. Am I not doing something I'm supposed to? Unable to find any schematics, no build instructions other than some pictures on flickr, which were helpful), and no email help line. Thanks for any instructions. I'm expecting this to be fun, and hoping not to have to pull out my scope and the chip datasheet to figure out how to make it work! 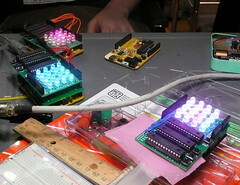 The RGB shield uses the SPI control lines on the Arduino, and those were moved to different pins on the Arduino Mega. On the mega, the assignments are 50 (MISO), 51 (MOSI), 52 (SCK), 53 (SS), while on the standard Arduino they are 12 (MISO), 11 (MOSI), 13 (SCK), 10 (SS). Since this is defined in hardware, you'll need to jumper from those pins on the shield to the real pins on the Mega to get the code to work. Thank you for the quick response! It probably says that in a few places, and I missed it. Actually, you're the first to ask about the Mega, so I had to do a little research -- there's a similar problem with the Ethernet shields. If I do a redesign, I'll try to get those signals from the ICSP connector which is in the same location on both the original and Mega.